Military Band De-Funding: What's At Stake? The college marching world is mobilizing in response to a budget proposal that would substantially limit funding for U.S. military band performances around the world. Rep. Martha McSally’s amendment to the proposed 2017 Department of Defense budget passed in the House on June 16, and limits the use of government funding to support certain military band performances. At the very least, this would curtail off-base performances at dinners, dances, and other social events, but could also affect some concerts, parades, diplomatic events, or occasions recognizing veterans and their families. This amendment will be up for approval with the rest of the military budget before the fiscal year ends in September. “It’s important to note that the military is the largest employer for active musicians,” said Mark Lynn, former Assistant Director of Bands at the University of Louisville, and current Vice President of Professional Service at VisionWorks. Based on this, Lynn said, one immediate impact of the change in funding would be many musicians out of work as military music budgets are slashed to save less than a fraction of the entire defense budget. Current costs for military ensembles stand at about $437 million out of the roughly $600 billion total defense budget, or around .07%. In a statement reported by the New York Times, the Pentagon said it has repeatedly asked Congress to consider the military’s own proposal to close some of its underutilized bases instead, which would save more than $2 billion each year. For the college music world, Lynn said the longstanding strong relationship between military music groups and college ensembles could be severely weakened with a drop in funding. In addition to the premier military ensembles stationed in Washington, D.C., many regional ensembles provide an outlet for smaller communities to experience live music and high-level musical training where none might exist otherwise. “Even those local groups are really, really good,” said Lynn. “Consider Fort Knox, for example, which has a small military band. There’s nothing else really around there, so any kid who wants private lessons or extra music experience, that’s where they’ll go.” Lynn noted that this Fort Knox illustration is just one instance of a pattern that repeats nationwide. Some results of previous cuts to military music budgets can already be seen. 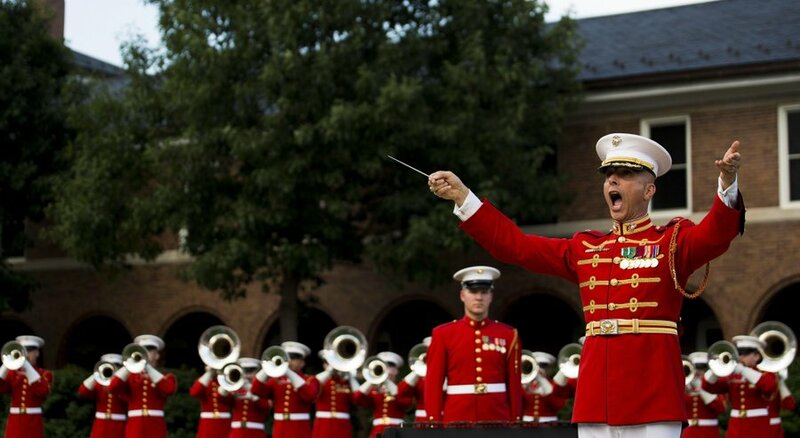 CollegeMarching.com staff was able to speak with Major Brian Dix, who retired in 2014 after spending 16 years as director of “The Commandant’s Own” U.S. Marine Drum and Bugle Corps. Musicians come to “The Commandant’s Own” with experience in some of the top U.S. marching bands and drum corps, and must successfully complete Marine basic training in addition to their rigorous audition process. Major Dix said there is great concern among high-ranking military personnel about what a decrease in funding could mean for the future of outreach conducted by military bands. “Generals understand how providing band outreach opens a dialogue between communities and the bases they represent,” he said, adding that music can go a long way toward alleviating he “us-and-them” mentality that often occurs when working within diverse local populations. Major Dix also said a visit from a band can open doors to schools and universities that may have declined military recruiters on campus, pointing out that employing musical assets can greatly assist meeting enlistment goals in our all-volunteer armed forces. The 80 members of “The Commandant’s Own” travel thousands of miles each year to performances all over the country, and sometimes deploy on special international missions as well. Many of these missions (though off-base and outside of the U.S.) are strategic assignments that have specific goals to strengthen relations between the U.S. and its counterparts. Major Dix pointed out that with bands at their disposal for deployment abroad, U.S. diplomats can provide a venue for heads of foreign governments to be seated jointly while listening, appreciating, and most importantly applauding their countries’ differences — all through military music. Major Dix’s own career is an example of this artistry in action. As a child, he grew up dreaming of serving in the military. He enlisted in 1983 under an open contract with a band option. Major Truman W. Crawford, then-director of the U.S Marine Drum and Bugle Corps, paid special attention to Dix’s enlistment and initial training. Six months later, Dix’s MOS (Military Occupational Specialty) was updated to the Drum and Bugle Corps. “My life changed all thanks to him,” Dix said of Crawford. Major Dix acknowledges that to some people, seeing a prerequisite for musical skill before enlistment can be off-putting, saying that it “seems to concern some people that a saxophone player is not a real soldier,” for example. However, all musicians in the military operate under the Uniform Code of Military Justice, and each branch determines its own training regimen. This stage could shrink substantially for all military bands if the proposed amendment passes in its current form. College band directors across the country have been pushing back and hoping that their alumni and supporters will join their calls for mobilization. The CBDNA (College Band Directors National Association) has provided resources for band directors and students. Supporters of military bands can contact their state’s senators to add their voice to the cause. In addition, petitions are being prepared on both White House.gov and Change.org to force discussion on the issue of military band funding before the new budget is passed.